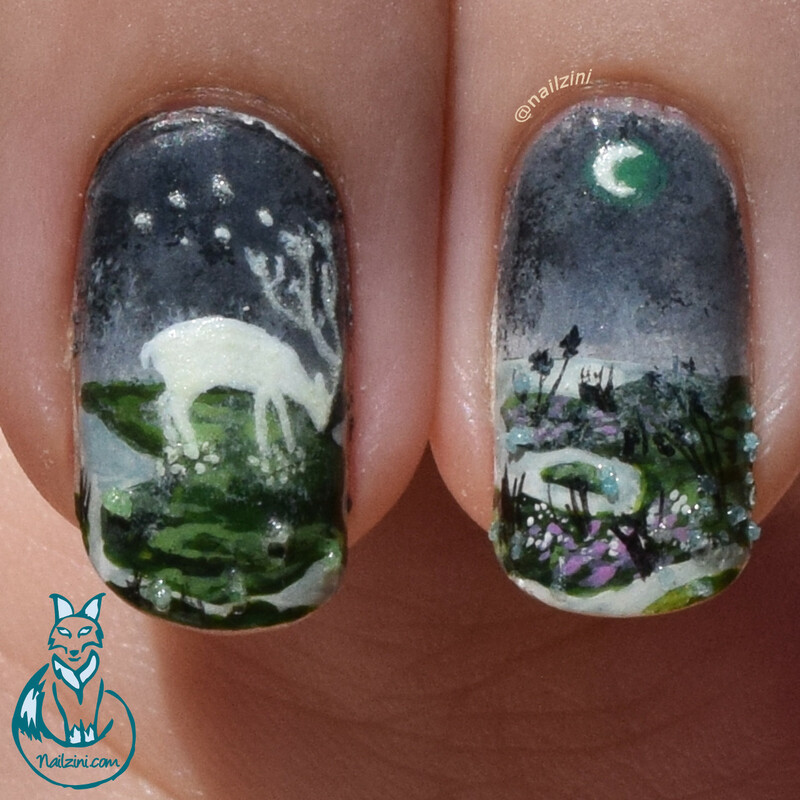 There is almost no nail polish involved in this design, everything you see is done with Jo Sonja's acrylic paint. I first applied one coat of "Blanc" by Essie to get a nice white background to paint on. 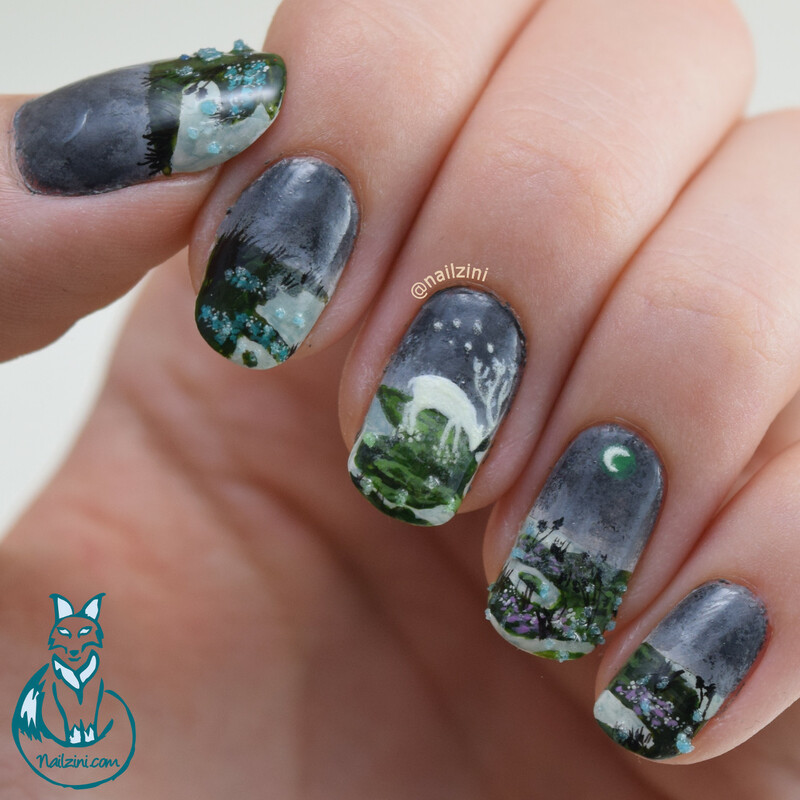 The dark grey background/night sky is sponged on and the rest is hand painted with the "Tartofraises roubloff detail 00" brush by Adnails Manucure. Then I used "Glowing in the Dark Paint" by Panduro to go over the deer and the moon in order to make them glow in the dark. The last item(s) I received from Born Pretty is this luminous glitter powder (ID=30758) in blue (#3) and green (#6). It also comes in pink, purple, orange, yellow, and white. Even though it's called a powder, the texture is more like coarse sea salt, maybe a little smaller than that. The powder is stored in a little plastic container which contains 3 grams. I applied green powder to my middle finger and blue to all the others. 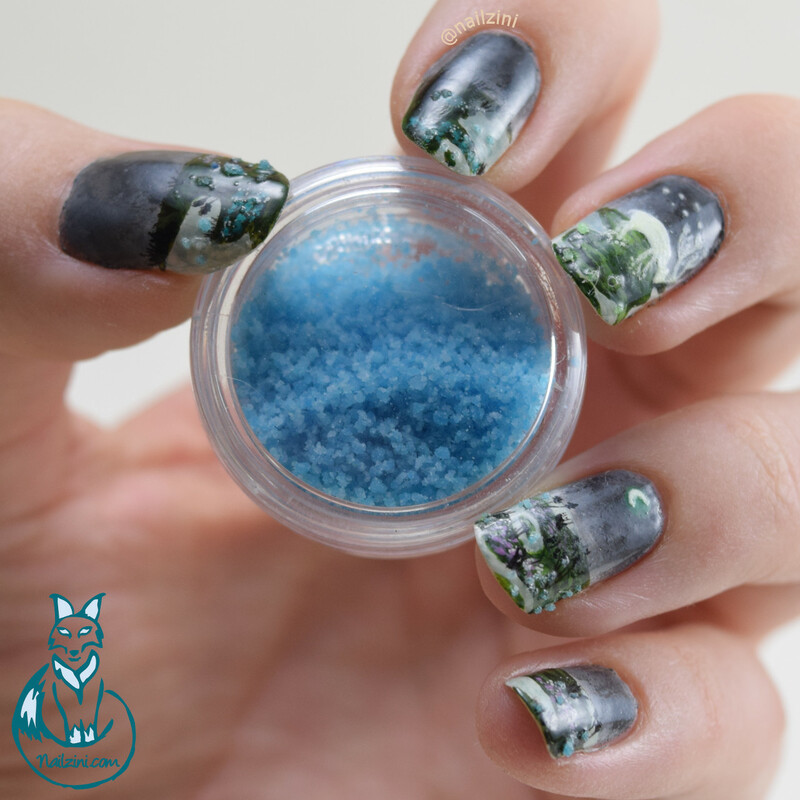 On my nails I only noticed a slight difference in color between the green and blue in daylight, but in the dark the difference wasn't noticeable at all. Maybe if you put more powder closer together the difference will be more visible. I'm loving this powder! I applied some topcoat on half of my nails and pressed the glitter on. Then I covered it with one thick coat of my "Inta-Dri" by Sally Hansen and it stayed on my nails for more than a week! As you can see in the picture below it's very bright. Before taking this picture I held the containers, without the lid, under my 5000k daylight lamp for about 20 seconds. That was definitely more than enough to charge these little jars. The luminosity of these little crystals is truly amazing! I'd want to have these on my nails at all times if they weren't that big. 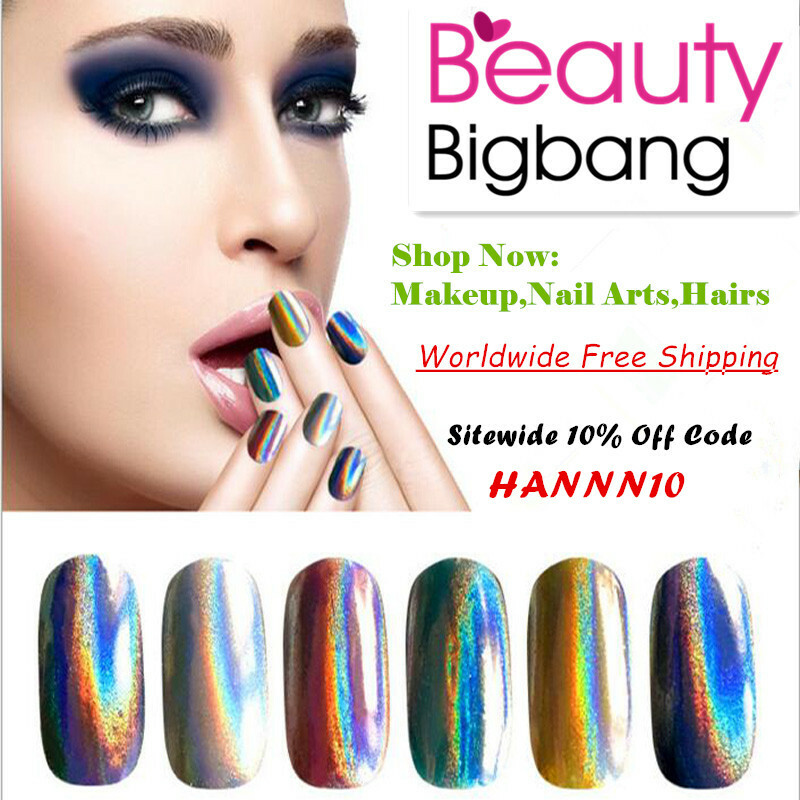 Even with a thick topcoat you can still feel the little stones, so if you like to have smooth nails these probably won't be for you. 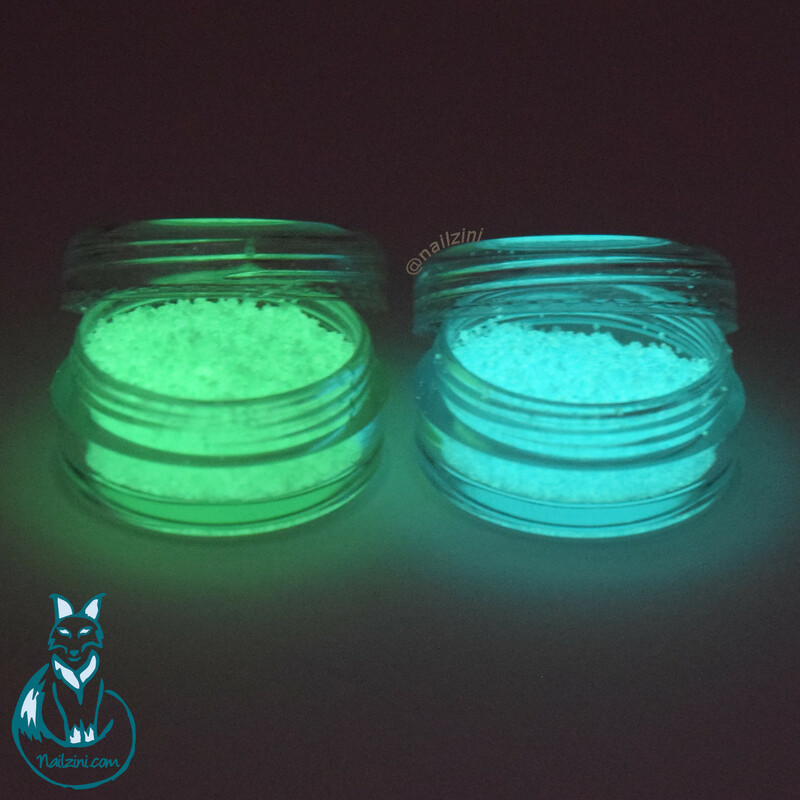 You can however use them to decorate other things, like cell-phone cases or anything else you'd like to add a little glow to.